Review: You may have noticed that I did not give this book a rating because I did not finish it. I usually don't review books I don't finish, but I have a few things I'd still like to say, especially since so many people want to read this book. However, I think these three things (since they don't have anything to do with story line, per say) are still warranted. This book is VERY British. I had a really hard time understanding what Grace was saying because she used so much British slang. The ARC I read seemed like it had come from the UK, so I don't know if any of that will change when it is published in the US. Grace is not likeable. Sure, maybe I could be sympathetic towards her and her unfortunate situation. But I could. not. like her. She's an underage-alcoholic, she sleeps with anything that will hold still long enough, she's suicidal, she's bitter and nasty, and she swears like a sailor, which brings me to my next point. It is EXTREMELY profane. This is what stopped me from reading it. At the beginning you only see the f-word about once every twenty pages, but after you hit page 100 you start seeing it ALL THE TIME. I can't read a book like that. I was just flinching all the time, and it distracted me. If neither of those bother you(and the British thing didn't really bother me, it just made the book hard to understand), then you'll probably like Entangled. It has a FASCINATING story with a great ending. I had someone give me a plot summary, because even though I skimmed the last 200+ pages, I had NO idea what was happening. This is not a book you can skim. Very convoluted. I can see this being a movie, and a really good one. Is the swearing to the same amount as The DUFF? There was a hell of a lot in that book, but it actually worked. I think I'll still try this one out, because there's still been a lot of praise for this book. Thanks for the review though. I'll keep those things in mind. I haven't read The DUFF, and I don't plan to. If there's "a lot" of swearing, it rarely "works" for me. I can understand it when characters are being hunted or are about to die, but I really don't like "casual" swearing. I don't believe in swearing when you are angry. There are better words. I'm not that judgemental about characters. I recognize that the majority of people (and characters) don't think the way I do. But if a character swears just for the heck of it, it drives me CRAZY! Rats, these happen to be the things that really bug me about books. Maybe there is redemption towards the end? Thanks so much for the review! The premise had me wanting to buy it, but I don't appreciate swearing and the 'sleeps with anything that will hold still long enough' bit tells me I won't enjoy it at all. The other 'behavior issues' I could probably deal with, as long as there was a point and a change, and suicidal protagonists I actually love because depression is real and difficult and books can show that. But I know enough young women who will 'sleep with anything that will hold still long enough' in real life. I don't want to have to tolerate them in my fiction. Unless that aspect really, really lies in the background, in which case I might read it anyway just because of the mystery. Now, if I choose to borrow it or get it from the library someday, I'll know what to expect. Thanks again for the review-I'm glad I didn't buy it and then get my high expectations 'crushed to bits like crackers in a fat man's bed' XD. PBS fans, anywhere? Redemption? Hm... I'm not sure. The ending has such a twist that I'm not sure I'd call it "redemption." She never really changed in her behavior. But again, that twist at the end really threw things off kilter. Maybe she would have changed if the book had been longer. And I'm pretty sure her suicide wasn't depression based. Sure, she was pretty messed up psychologically, but *I* thought the suicide attempt was more anger-driven. Sort of an "I'll show them" thing. This has been on my to read list for a while now. Your review is helping make my decision. 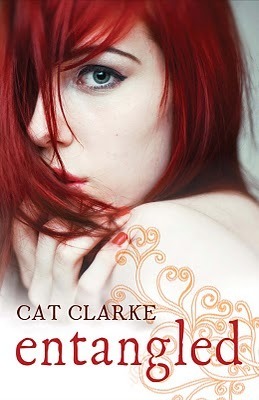 The cover reminds me of Florence Welch from Florence and the Machine. The girl looks very similar to her. Way to walk away from distracting profane-ridden glop. Occasionally, well-placed epithets make the story work. An abundance of them is simply cheap and lazy, IMHO. Squeak on! Thanks for the review! I keep seeing this one recommended, but when I go to goodreads I've never marked it as to-read and so I finally looked up your review to remind myself why. I wouldn't be able to read this one with all of that stuff in it. I hate it when they add things that just distract from the story!